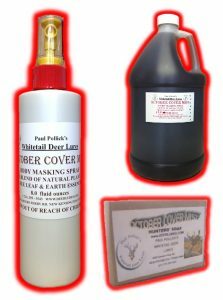 Trail, area cover, and body masking are the tree types of natural cover scents used for hunting whitetail deer. The two most commonly used trail cover scents are red fox urine and Raccoon Urine. These urines have a strong natural odor common to most deer habitat which doesn’t spook deer when they smell it. Deer hunters often use plain doe urine as a trail cover scent. A long lasting trailcover can be laid down by saturating Pollick’s Felt Boot Pads with our Red Fox Urine and Musk. Every 100 steps or so lift your boot and re-scent lightly with more Red Fox Urine and Musk. When you reach your desired destination, remove your boot pads, re-saturate and hang on a low bush or branch a short distance from you around your stand. The changing air currents will distribute the strong, foxy odor of the cover scent to act as a natural cover in the immediate vicinity around you without calling direct attention to your presence. 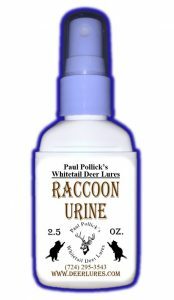 Never apply a strong natural animal urine cover scent such as fox urine or raccoon urine on your outerwear, equipment, or too close to your immediate stand location. Animal urines are positive attractors. If the wind direction is right an approaching deer may spot you before ever reaching your stand. There are concentrated oil cover and food scents which are common and plentiful in different areas you hunt. If you are hunting near a large corn field, pine grove, apple orchard, or acorn stand these would be good concentrated oil scents to use as cover scent in those immediate locations. Concentrated oil scents can be placed on Pollick’s Scent Wicks to disperse cover scent or positive food odors in the vicinity around your hunting stand. Always retrieve any hanging scent wicks or boot pads and place in a clean zip lock bag so deer are not drawn to your location after you leave. Reapply fresh scent and these can be used again for your next hunt. Body masking cover scents are not made to kill human odor. Nothing can kill odor completely. Odors can only be reduced to their lowest molecular point, and immediately begin to rebuild. Body coverscents are designed to mix, blend and mask human odor as it is emitted and travels out into existing air currents. Body masking scents should possess a strong natural scent of the live vegetationwhere you hunt. A good body masking cover scent acts as a neutral scent native to the immediate area which neither attracts nor repels the attention of deer in that location. Earth Scent is a reliable time tested and proven universal cover and body masking scent. Earth Scent is made by chemists to closely imitate the smells of fresh earth and damp humus. Pollick’s October Cover Mist is gathered locally in Pennsylvania and thoughtfully made by us. October Cover Mist has drawn praise by experienced hunter all around the country since 1995. Pollick’s October Cover Scent consists of ten equal parts of the natural extracted juices from tender young plants, tree leaves and vines. Wild ferns, jewel weed, golden rod in blossom, hemlock, oak, maple leaves and earth scent are part of Pollick’s October Cover Scent natural odor masking formulation. I myself and many successful hunters I know and process for during the hunting season never begin a hunt without the helpful aid of a good body masking cover scent. October Cover Scents broad spectrum of natural plant and woodsy odor has proven to be an excellent body masking cover wherever it has been used. Mist October Cover Scent on your hat every two hours while hunting and see how readily whitetail deer approach your stand without ever detecting your location. One last body masking cover scent to help reduce human odor is Pollick’s October Cover Mist Soap. It will leave your skin with a light woodsy odor before your hunt.